→PART 1: Core Stability for Horse Riders….. What is All the Fuss About? 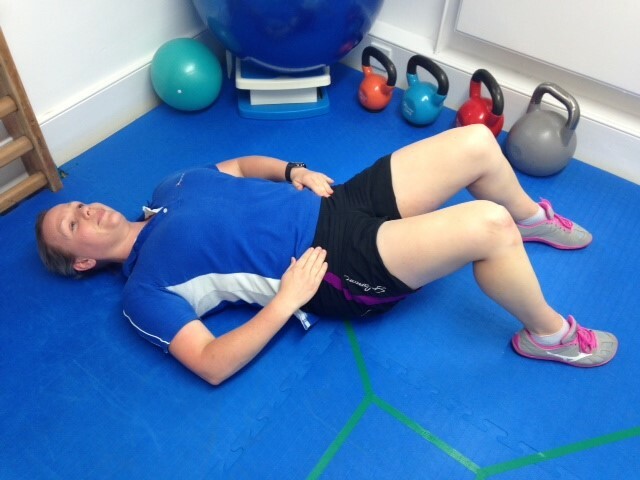 PART 1: Core Stability for Horse Riders….. What is All the Fuss About? As horse riders we are all guilty of paying more attention to the horse and its imbalances and stiffness’s, but what about us? What if we are causing the horse’s imbalance or stiffness by being asymmetrical? What if the horse cannot produce medium trot, not due to its own fault but due to our inability to half halt correctly to maintain their impulsion? Having a strong core can help with all this and a popular way of strengthening your core is through a form of exercise called Pilates. Pilates was developed by Joseph Pilates. Its aim is to emphasise the balanced development of the body through core endurance, flexibility and awareness, in order to support efficient, graceful movement and increase spinal stability which inevitably will help the rider. A problem I frequently encounter with my clients is that they don’t truly understand what their core is let alone how to engage it, even if they have been to Pilates classes. So let start from the beginning…. 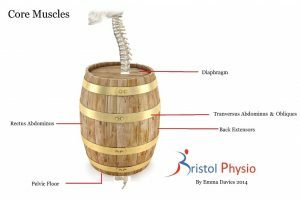 I like to visualise the core as being similar to a wooden beer barrel. As the image below shows, the beer barrel (Core muscles) acts as a protective housing for the spine. 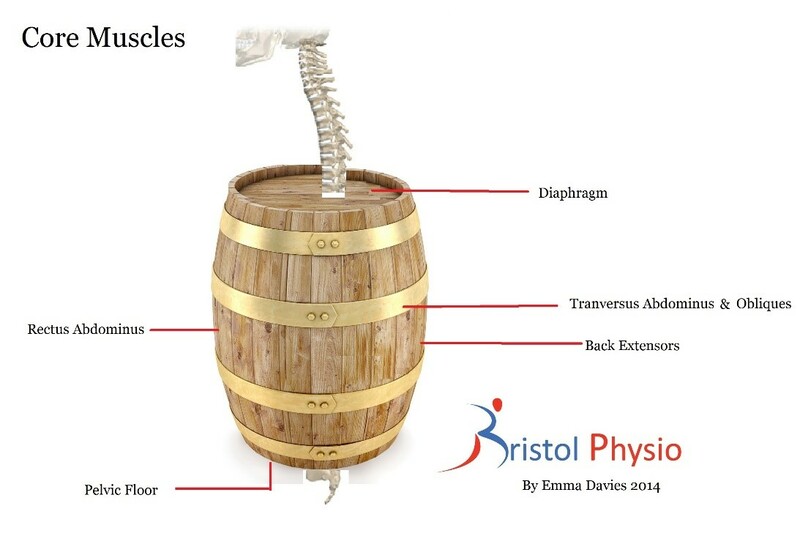 The top of the beer barrel is your diaphragm and the bottom is your pelvic floor. The wooden struts making up the sides are your trunk muscles, rectus abdominus (abs) and back extensors. The metal supporting belts are your transversus abdominus muscle and obliques muscles. Now imagine that the metal belts were removed (weak transversus abdominus and obliques) and the top and bottom were weakened (poor use of diaphragm and pelvic floor). What do you think would happen to that barrel if it were jumped on top of? …. it would collapse. The same goes for your torso – it would slouch, leading to a weak riding position. How do you ‘engage’ the core? There are multiple terms used to describe activating your core muscles, some examples include; “zip up”, “engage core”, “brace core” and “drawn belly button in”. The best way to learn about your own core is to feel it! Start by lying on your back with your knees bent up and feet placed on the floor. Place your hands on the front of the bony prominences just below your waist. Then head in toward your belly button by a couple of centimetres to where it’s soft, pictured right. Now have a cough… you should feel a sheet of muscle push up under your fingers. This is your transversus abdominus. Next you need to try and re-create the sheet of muscle pushing up without coughing. This may take several attempts. I will often get clients to imagine that they are bracing to protect themselves against an object falling onto their stomach or trying to blow up a really stiff balloon. Once you feel a similar pushing up on your hands to when you cough, make this contraction softer, breath out at the same time and draw up your pelvic floor (this will feel like trying to stop yourself from peeing). Basic Exercises to Train Your Core. To get you started on training your core here are a few basic exercises. Why Should I Use My Core? As explained above having a strong core provides stability and protection for your spine. This is not only needed whilst riding but when you are mucking out, lifting feed bags, grooming and picking out feet, to name a few! Aid your riding position by giving you dynamic stability, symmetry and efficient shock absorption. Be used to control your horse, especially in flatwork, i.e. the half halt. Help you gain an independent seat and remain balanced when jumping. 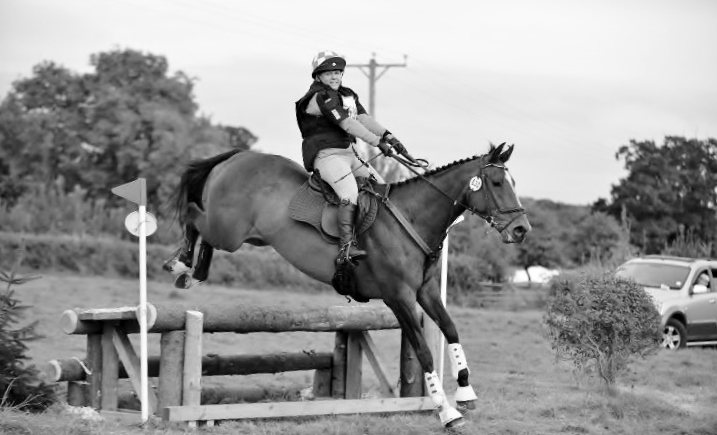 Help you regain balance after being unseated when jumping or when a horse ‘is having a moment’! The core muscles play a role in proprioception, this the body’s ability to sense where it is and how it is moving. In walk, notice how your seat bones move left, then right, then left again ….and so on. Feel how much movement is in each one of them? Now engage your core and try to reduce how much your seat bones move. Can you halve it? Can you halve it again? What happens to your horse when you do this? 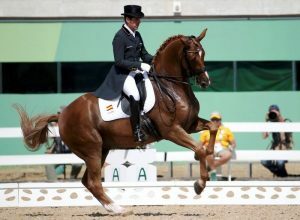 Getting control of the speed of your seat bones is a prerequisite for having control of the horses’ legs and therefore having tempo control. Having tempo control is a prerequisite to being able to generate impulsion. In Part 2 we will take the core strengthening exercises a bit further and look at why flexibility is important for horse riders.